They had only 11 encounters in a television series that ran 278 episodes plus a pilot movie. Yet, for many fans, Hawaii Five-O was defined by the battle between Steve McGarrett, the no-nonsense head of a ficitious Hawaii State Police agency (Hawaii has no state police of any sort) and Wo Fat, initially the top espionage agent for the Peoples Republic of China, later an independent operator. Their meetings brought a escapist world menace sense to what most of the time was a down-to-earth police show. Indeed, for an outsider, it seems hard to fathom how a state police unit kept bumping up against such an international menace. But, more often than not, the clashes between McGarrett and Wo Fat were so engrossing it was easy enought to put that quibble aside. As McGarrett was Jack Lord, the screen’s first Felix Leiter. He wasn’t the first choice for the role and was hired only five days before the filming of the two-hour pilot TV movie (this was disclosed during a Five-O convention in the fall of 1996 in Burbank, Calif.). Yet, the role defined Lord’s career, overshadowing all his previous work. When he passed away on Jan. 21, 1998, he was Steve McGarrett to most. McGarrett’s arch-enemy was Wo Fat, introduced in the pilot. The first draft of the script described him as a “little Budda,” with thick glasses (I had a glance to see that script at the aforementioned 1996 convention). Series creator Leonard Freeman took the name from a Chinese restaurant in Honolulu. However, actor Khigh Dhiegh (who wasn’t Asian but could play the role without extensive makeup) took what could have been a stereotype and made Wo into a sinister, yet obviously intelligent, adversary. He had practice at this before, most notably in The Manchurian Candidate (1962), where he played a Chinese brainwashing expert. At his best, Dhiegh made Wo Fat into a world-class adversary and made one imagine what he could do in a big-budget film. What follows is an examination of the blood feud that would extend a dozen years. McGarrett begins an investigation, much to the chagrin of Brent, the top U.S. intelligence official in Hawaii (Leslie Nielsen). But McGarrett pieces together the puzzle. Then, the top U.S. spymaster, Jonathan Kaye (James Gregory) comes to Hawaii, and brings McGarrett into his confidence. They plan a trap that, if successful, will plant disinformation witht he Chinese. But first, McGarrett must undergo the same torture in W Fat’s “sensory deprivation” tank. Review: A pretty strong plot, the scenes with the deprivation tank at the start are eerie. Leonard Freeman, though, isn’t the smoothest writing dialogue with phrases like “Blanksville,” apparently intended to show us characters are hip. McGarrett is a real hot head here, at one point barging into Brent’s office and knocking down one of his assistants. Nancy Kwan is the love interest, playing a graduate student who was dating Hennessey. Khigh Dhiegh is excellent in a scene where, after having captured McGarrett, he explains how the torture works. As part of the trap, Wo Fat must be allowed to leave (with all the disinformation McGarrett provides; he has been hypotized to deliver false information under duress). Finally, Morton Stevens, besides delivering the wonderful Five-O theme, has a good dramtic score. One of his tracks (where a U.S. intelliegence man tails McGarrett) would be recycled throughout the first three seasons of the show. 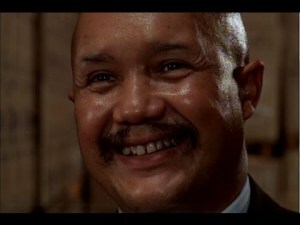 Khigh Dhiegh as Wo Fat in Forty Feet High and It Kills! Plot: Wo Fat arranges to send out a false tsunami warning. While there’s general panic, his men kidnap Dr. Lochler (Will Geer), a leading genetic expert. Five-O tries to get the doctor back before Wo Fat can get off Oahu. Review: Pretty simple and straight forward. Two sequences set this episode apart, however. There’s bantering between Wo Fat and Lochler, who keeps insulting the Chinese spy. Wo, though, keeps his cool and ultimately prevails in a contest of wills. Plot: Five-O investigates a “commie spy ring,” which includes Dr. Paul Farrar (Eric Braeden), an expert in hypnotism. It turns out his superior is Wo Fat. When McGarrett sends in an uncercover policewoman, Wo Fat suggests Farrar hypnotize her to kill McGarrett. Review: Unfortunately, only a one-scene cameo for Khigh Dhiegh. Too bad, more of him might have enlivened the rest of the episode. McGarrett is practically Superman. He gets shot in the chest by the hypnotized policewoman, yet engages in a knockdown, drag- out fight with Ferrar, including a judo throw. Plot: A spy for U.S. intelligence arrives in Hawaii with knowledge of Chinese missile silos. But Wo Fat’s men shoot him before he can talk. When the wounded spy is taken to the hospital, Wo Fat kidnaps the daughter of the surgeon who will operate on the dying man. Wo Fat will kill the girl if the spy survives. The surgeon won’t kill the spy, but the patient dies anyway. The Hawaii station chief (Gerald S. O’Laughlin) wants to put out disinformation that the U.S. now knows all the missile silo locations. Five-O tries to get to the daughter in time. Review: Wo Fat provides a hint of his past while playing chess with the kidnapped girl, hinting at a loved one killed during tumult in China. Lots of headbutting between McGarrett and the station chief. Once again, the need to provide disinformation to the Chinese forces the authorities to let Wo Fat get away. Plot: A U.S. serviceman turns up dead in the Ilikai hotel, killed by two men who are revealed to be agents for Wo Fat. They bring him a cheap Budda statue, which Wo shatters. Inside, there are two plain pieces of metal. Wo throws them away angrily. Five-O is investigating the murder when once again U.S. spymaster Jonathan Kaye (played by Joseph Sirola here) comes on the scene and requests McGarrett’s help. It turns out China developed plates that will produce perfect counterfeit $20 bills — which China plans to use to print counterfeit money en masse and wreck the U.S. economy. However, the plates got away from the Chinese, with various criminal and espionage types looking for them. Kaye says the U.S. knows the plates are coming to Honolulu but little else. What Wo Fat had were fakes and the dead serviceman was really Leo Price, a criminal who had killed someone else for the plates. At the end of part I, a friend of McGarrett who is in U.S. Navy Intelligence is revealed to have been seeking the plates for his own gain. He’s in cohoots with international criminal Nicole Fleming (Sabrina Scarf). But Nicole, unknown to her lover, is offering the plates to Wo Fat and Soviet spy Mischa (Roger C. Carmel). Various twists occur before the final fate of the plates is known. Review: You wouldn’t guess that counterfeiting would be this big a deal, but the briefing scene where Kaye explains everything to McGarrett is handled quite well. You come away believing this really be disastrous if Five-O fails. The various contestants for the plates are quite a colorful bunch. Nicole, described “as deadly as she is female,” is the amoral femme fatale. Mischa is a big, gregarious Russian who had been lied to by Wo Fat concerning the existence of the plates. Highlights include a helicopter assault by Five-O on Wo Fat’s Honolulu headquarters and a climatic sequence at the Byodin temple where Wo Fat appears to be mortally wounded but gets away to cause McGarrett trouble another day. Plot: McGarrett puts in a typical long day at work, leaving around midnight. Three hours later, he’s found in an upside down car, sitting next to a dead gangster and holding a briefcase full of money. When he’s extracted from the car, the Big Kahuna is temporarily paralyzed and the briefcase is also found to contain a book full of coded entries — indicating deposits of more than $2 million in a Swiss bank account. Who could pull off such a frame? You needn’t even ask. Five-O makes it appear McGarrett is fleeing the country before he’s sent to the pokey. We cut to Switzerland, where McGarrett seems to be withdrawing his money — until the real Big Kahuna shows up. A bank guard mortally wounds the bogus McG, but not before he says, “Wo Fat stole my soul for 90 seconds.” In part II, Jonthan Kaye (Tim O’Connor here) deputizes McGarrett to find out why Wo Fat has spent millions of dollars and three years building the frame and what he intends to do with the 90 seconds. A German-born scientist (Donald Pleaseance) at a key U.S. installation holds the key to the mystery. Review: Part I moves very quickly and disguises its “villain creates a double for the hero” plot surprisingly well. Also, the sequence where McGarrett is found in the car is engrossing and there’s a bit of suspence regarding whether McGarrett’s paralysis is permanent. In Part II, we get a little tired of Kaye’s overbearing ways. Also one wonders how the representatives from the Army, Navy, CIA, FBI et al feel when they have to report to a state cop. We learn that the Governor’s real name is Paul Jameson via a nameplate at a big meeting of hounchos at the start of part II. One nagging question: If Wo Fat spent three years setting up the frame, why did he have Dr. Farrar try and kill McGarrett back in “A Bullet for McGarrett”? At the end of “The Ninety-Second War,” Wo Fat again is at large. But real life would soon cause a major effect on the fictional McGarrett- Wo Fat blood feud. In 1972, in what was either a stunning diplomatic coup or a cynical ploy for re-election (or both), President Richard Nixon visited mainland China. It would still be several years before full diplomatic relations occurred, but in one stroke Nixon had re-established ties with China. So what’s this history lesson got to do with Hawaii Five-O and spies? 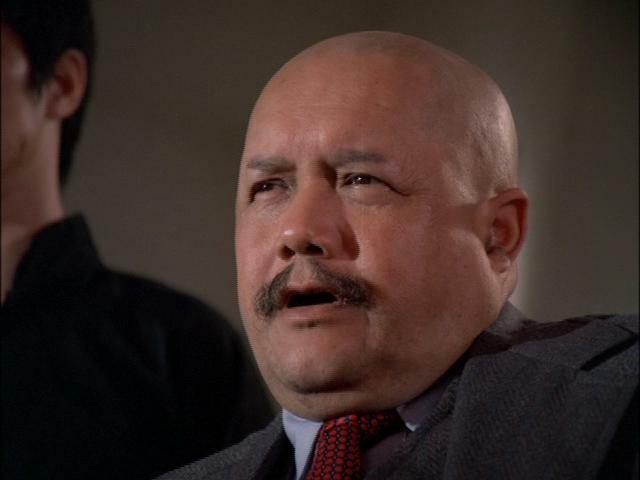 Until ’72, Five-O’s arch nemesis was Chinese spy Wo Fat. In the pilot, Wo was assassinating U.S. intelligence agents after torturing them in a sensory-deprivation tank and in a later episode Wo hoped to destroy the U.S. economy with perfect counterfeit plates. Suddenly, however, Americans were watching their president drink toasts to Chinese leaders. But these were the guys who employed Wo Fat! Well, not really, of course. But for Five-O producers, it meant that maybe, just maybe, Wo Fat wasn’t exactly representative of all Chinese. This would affect future story lines in a significant way. Plot: Two operatives infiltrate a U.S. military installation, killing most of the men on duty. One operative gets over the fence but kills the other before the second man can follow. The first operative runs to a limousine where Wo Fat is waiting. But one soldier survived the attack and sounds the alarm. It turns out Wo’s men have stolen a new guidance system for missiles, much smaller than previous models. U.S. spymaster Jonathan Kaye (Joseph Sirola) comes to Hawaii and again deputizes Five-O and McGarrett to coordinate the investigation. Meanwhile, Wo is manipulating Tom, a naive Chinese American Maoist (Soon Tek Oh). Wo plans to kill his father and brother, leaving Tom the oldest man in his family. Tom’s father will be buried in Taiwan, and Wo will smuggle the guidance system in the casket. McGarrett and crew figure all this out and get Tom on their side. With Tom’s help, Five-O captures Wo Fat. But, back at McG’s office, Wo doesn’t seem too worried even though he’s carrying a U.S. passport (which, McG notes, will enable him to prosecute Wo as a traitor as well as a murderer). But Jonathan Kaye comes in and says Wo has to be freed. It turns out China has a captured U.S. spy plane pilot in prison. He’ll be exchanged for Wo Fat. The episode ends with McGarrett slamming Wo’s fake passport down on his desk. Review: A hell of a last scene. “You sold me out, Jonathan, you sold me out!” McGarrett yells at Kaye before the federal bigwig can explain. The last image, of McGarrett angrily throwing the fake passport, is a stunner. At one point, Wo Fat receives a message from a superior who is displeased with all the killing Wo is doing. This gives a hint of future Wo Fat story lines. Plot: Episode opens with what appears to be a U.S.-Chinese American conference. A waiter enters the room with a hidden weapon and attacks the lead member of the Chinese delegation. Just when it looks like it’s curtains, everybody stops. It turns out this is a training exercise, as Five-O and HPD are doing dry runs in anticipation of a real U.S.-Chinese meeting. Jonathan Kaye (Bill Edwards this time) has again turned to McGarrett & Co. to keep an eye on things. It turns out the practice is necessary. After not appearing in Five-O’s sixth season, Wo Fat has returned. This time, he means to assassinate his country’s representative at the meeting. Wo believes the Chinese group has come “on bended knee” to the Americans. The Chinese leader, meantime, has brought a nephew with him and the kid wants to go to the circus. By chance, two defectors from Cuba are part of a trapeze act. Wo blackmails them to participate in his scheme. But all is not what it appears…. Review: Decent plot is elevated by Khigh Dheigh as Wo Fat. In the end, the plot is foiled with Wo escaping and his No. 1 goon, Chow Lee, capatured. But the chief lackey must have had a good lawyer as we’ll see in our next review. Plot: An officer in Naval Intelligence at Pearl Harbor is killed by a letter bomb. By luck, Steve McGarrett, who we’re told is in the Naval Reserves (something previously unmentioned), is on active duty and brought in to investigate. We know something is up when Chow Lee (hey waitaminnit!) goes to a yacht where Wo Fat is waiting. McGarrett (who brings Five-O into the case) has a complicated jigsaw puzzle of an assignment. Reivew: Not the strongest Wo Fat episode. In fact, the villain isn’t seen very much for long stetches. As it turns out, writer Hampton submitted a spy-oriented script that didn’t use Wo. CBS moved the show to Friday nights this season to try and knock off The Rockford Files on NBC. So the network wanted to start the season off with a bang. Thus, writer Coopersmith was brought in to expand the story and add Wo Fat. But the episode seems padded in places. For example, early in the episode, we watch this long, tedious sequence where McGarrett transfers from one ship to another so he talk to an admiral, who assigns McG the case. Not a bad episode, but not the most memorable encounter between the two adversaries. At the end, Chow Lee is arrested again. But, then again…. Plot: McGarrett wakes up on a boat, about to be dumped in the sea near Hong Kong. He effects an escape and is picked up by Suzy, a woman who’s on a small fishing boat. She takes the lawman to Hong Kong. But he doesn’t even remember who he is until he sees his face on a newspaper. As McGarrett and Suzy try to find the authorities, they are attacked by members of a triad. McGarrett remembers he has to stop some event at 4 o’clock. We’re then shown a long flashback. Two extremely potent toxins were stolen by Wo Fat in Hawaii. McG has followed the trail to Hong Kong, only to be kidnapped by Wo’s operatives. McG is then brainwashed. Wo plans a coup to take over China, using the toxins to kill the Chinese leadership. A propaganda film, using the brainwashed McGarrett, will make it look like the Americans did it. Wo will then launch nuclear missiles at the United States. Review: One of the strongest episodes of the series, and perhaps the most Bond-like plot. People who have read Raymond Benson’s “Zero Minus Ten” novel might enjoy this episode, which shares many of the same elements. This was director O’Herlihy’s swan song for the series (he had directed many of the series’ best shows) and he goes out with a bang. It’s also the next-to-last episode written by Coopersmith, Five-O’s most prolific writer (32 episodes) and he comes up with a superior effort here. However, when we see Wo Fat arrive in Hawaii, Chow Lee is picking him up at the airport. Sheesh! The guy must have had the best defense lawyer in Honolulu. The score by Morton Stevens is outstanding. Plot: A scientist (Patricia Crowley) is abducted but goes peacefully after being exposed to gas that eliminates a person’s will to resist. She finds herself whisked to a remote island in the Pacific, where she meets two other scientists. Their host turns out to be Wo Fat. Each of the scientists participated in a conference eight years earlier where a laser-based missile defense system was proposed (this episode aired two years before the so-called “Star Wars” missile system proposal). In Hawaii, another scientist, Elton Raintree (looking suspiciously like Jack Lord with an Albert Einstein wig) has just underwent a throat operation. Raintree, supposedly the world’s greatest physicist since the death of Einstein, can put together the work of the three missing scientists. The Navy, for reasons unexplained, willingly lets McGarrett take Raintree’s place. Soon enough, McGarrett is whisked to the same island. Eventually, he and Wo Fat have a hand-to-hand fight to settle this feud once and for all. Review: Hardly the finale the series deserved but the show’s quality had fallen steadily starting with the 10th season. The 12th, and final, season was generally horrible. This isn’t the worst example. Wo must have gone semi-senile after Nine Dragons, unable to detect McGarrett for the longest time. And the 59-year-old Lord and the 70-year-old Khigh Dhiegh look their age in the “climatic” fight. The conflict between McGarrett and Wo Fat was always like a chess game and the notion of a hand-to-hand battle was just wrong. The best thing, by far, about the episode is the fine score by Morton Stevens. 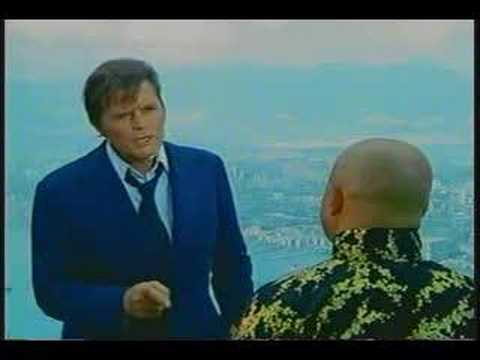 All in all, the McGarrett-Wo Fat faceoff provided one of the better moments in adventure television shows. Despite the disappointing last act, Five-O generally was at its best when utilizing Wo Fat. 2015 epilogue: CBS begain airing a new Hawaii Five-0 series (with a different spelling than the original Five-O) in the fall of 2010. It didn’t happen right away, but before long a new version of Wo Fat showed up. In an episode airing DEC. 13, 2010, Wo Fat 2.0 was introduced at the very end of the show. 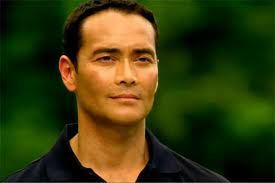 The new Wo Fat (Mark Dacascos) was younger, more fit and did much of his own dirty work in addition to being a mastermind. Over the next four seasons, it was revealed that this version of Wo Fat had a personal grievance against the new McGarrett (Alex O’Loughlin). In the show’s 100TH EPISODE, all was revealed. The mother of McGarrett 2.0 was a U.S. spy. She had been assigned to kill the father of Wo Fat but killed the mother instead. She attempted to raise Wo Fat as her own but her U.S. intelligence bosses vetoed the idea. In the 100th episode, the new McGarrett and Wo Fat had one, last big fight. They’re laying on the floor, exhausted, each holding a gun on the other. Wo Fat sarcastically calls McGarrett brother. “You’re not my brother,” McGarrett replied. BLAM! No more Wo Fat. To say any more would be a huge spoiler. But there’s a reason why James Bond fans should become familiar with this story line.